#team2499 we are meeting as normal tonight. 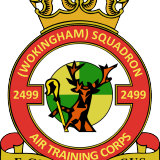 Remember TG21/TG23 forms for IOW camp. Last chance tonight for sorting and pre-camp issues. @moseph22 That’s right #Team2499 are chilling in the sunshine with our fully air conditioned Sqn HQ!